You’ve been challenged to gather as much fruit as possible to make the world’s best fruit salad. Click here to play! Gather enough fruit in this 3 reel game and you’ll be rolling in the dough. As mentioned, the aim of this game is to collect as much fruit as possible. Luckily the reels are bursting with fruity abundance and each one offers a pretty generous payout. For example, spin in a banana or two to collect a payout worth up to 50 coins. Apples will payout up to 30 coins. There are also plums, watermelons, and cherries that hold a top payout of 15 coins and 10 coins respectively. 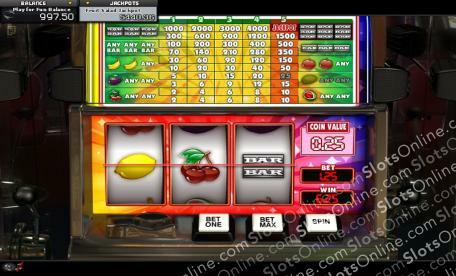 The reels also contain single, double, and triple BARS that offer high payouts when spun across the single payline. Be sure to wager the maximum of five coins to activate the jackpot pay table. That way you’ll be spinning the reels for some very handsome payouts indeed. Do you have what it takes to gather the fruit for the fruit salad? Spin the reels to find out and you could take home a very big jackpot.